A few months ago I started writing a piece on the why and how of my interest in motorcycles. Once I started writing it grew a bit unwieldy, so I decided to break things up into a few installments. 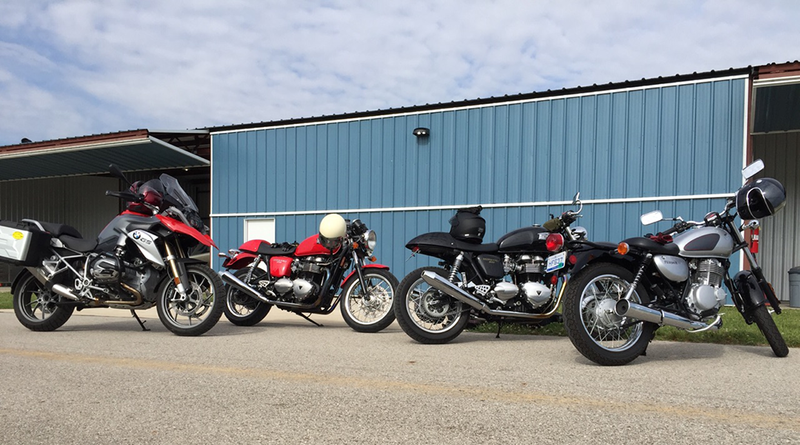 This is the first – where my interest in motorcycles came from in the first place, and how I got started. My partner Ryan grew up riding all manner of things with engines – dirt bikes, motorcycles, jet skis, you name it. I…did not. About nine years ago, he decided he wanted a motorcycle of his own. We tend not to question one another’s impulses when it comes to new hobbies, so I gave the shoulder-shrug-head-tilt gesture of “why not?” and off to Craigslist he went. I can’t recall how long it took, but soon he was the proud-ish owner of a 1991Yamaha FZR 600. Man, what a dirge. Big and plastic with a garish color scheme – so bad it was good – very 1990s. But the price was right for something he wasn’t sure he’d get a lot of use out of. We’re a thrifty bunch sometimes. I got a helmet and learned to ride on the back of a motorcycle. Just like that. Those first months tooling around back roads were great fun. There’s something so pure about feeling the temperature changes between shade and sun, tree-lined streets and open fields; or the buzzing heat while stopped at traffic signals. And the different scents are incredible. Fresh cut grass, pine forests, plowed fields, cool breezes, hot exhaust – it’s an olfactory smorgasbord in the best possible way. Riding two-up was a great first experience; I learned to put confidence in my driver and lean into turns as one, cooperating to keep the weight properly balanced. It got me used to the speed and the openness of it all. So in the spring of 2008, I made it official. I enrolled in the basic rider course and after a very cold, stressful weekend I earned my permit. (In Michigan, if you successfully pass a basic rider course your road test is waived – all you have to do is take a written exam at the Secretary of State.) I don’t remember too much about the course, except that everyone else seemed to be a complete natural, while I was a little totally unsure of myself. But I had done it! Fast forward to the summer of 2015. At this point a few more of our friends and family had gotten motorcycles. I was only partially part of the club. I got my license, but hadn’t ridden a bike on my own for close to eight years, which made me feel a little lame. And honestly, I was feeling kind of stagnant with life that summer – things had gotten too mundane around here. Hearing friends and family talk about their bikes and new adventures sparked a little something in a corner of my brain. After the first morning of riding I was hooked. Oh this was fun. Really fun. Kind of scary. And fun. The rest of the weekend was awesome. The temperatures soared to the upper nineties. Out on the blacktop riding range in the beating sun – fully dressed in helmet, jeans, boots, long sleeves, and gloves – I could feel the sweat trickling down my back and the engine kicking off heat. It was gritty and a little dirty, with the smell of exhaust and sweat hanging on us all. During breaks, we unbuttoned and unzipped a bit to let the breeze in, gloves tucked into back pockets, helmets resting on the ground. There was a great camaraderie among my classmates; we were eating this up, heat and all. A motley crew if there ever was one. We had two full days of riding, and by late Sunday afternoon we had all passed the skills test. We had gone from absolute beginners to something resembling bad-asses – at least in our own minds. That we still had a lot to learn was an understatement, but we had all passed our first test – literally. Topping out at 20mph in a parking lot is one thing… the open road is quite another. I had my license and a freshly renewed set of skills. What would be next? Stay tuned for the story of how and why I bought my first motorcycle.